According to a 2015 Gallup poll, 59 percent of Americans consider themselves sports fans. Since 2000, the average has been steady at roughly 60 percent. In today’s divided country, it would be pretty difficult to get six out of 10 Americans to agree on anything. This is no small thing. For an industry with such a massive audience, much of which is young people — 61 percent of 18-29-year-olds are sports fans, according to the poll — one might think that the sports world would take seriously its role as a leader and molder of society, culture, and thought. Seemingly more often than not, one would be wrong. This past week has been rough for sports. Last Tuesday, the Washington Redskins claimed linebacker Rueben Foster off waivers, despite the fact that he had been arrested for domestic violence just three days prior. The San Francisco 49ers cut Foster after the arrest, and despite being placed on the commissioner’s exempt list, Foster was picked up. After the signing, Redskins Senior Vice President of Player Personnel Doug Williams defended the move in a radio interview, saying “We’ve got people who are in high, high, high, high places that have done far worse, and if you look at it realistically, they’re still up there. This is small potatoes [compared to] a lot of things out there.” Yikes. Williams has since apologized for his ignorant response, and Foster will continue to be barred from practicing or playing in games. But the fact remains, an NFL team signed a player less than a week after he was arrested for commiting domestic violence. That’s despicable. And it’s not even the worst story of the week. On Friday night, the Kansas City Chiefs released star running back Kareem Hunt after a video surfaced on TMZ that showed him shoving and kicking a woman in a Cleveland hotel in February. The Chiefs’ statement indicated that the team had known about this incident, but no action had been taken. It was also revealed that in the league’s investigation, it did not interview either Hunt or the woman he assaulted, although they say they attempted to. You can’t make this stuff up. It shouldn’t have taken a viral video for the Chiefs to cut Hunt. They knew about the episode and did nothing. Hunt continued to play. On Sunday, ESPN gave Hunt a platform to “apologize.” Time and again, the NFL and its teams make their priorities abundantly clear: success above all else. Why cut a star player when it would just cost the team money and wins? Why take domestic violence seriously when it would just cost the league money and viewership? These controversies come alongside a similar, yet notably different, case in Major League Baseball. In October, MLB suspended Chicago Cubs shortstop Addison Russell for 40 games for violating its Joint Domestic Violence, Sexual Assault and Child Abuse Policy. Russell accepted the suspension. On Nov. 30, the league’s deadline for teams to tender contracts to arbitration-eligible players, the Cubs reached a deal with Russell to keep him under team control for the 2019 season. Before I go further, let me say this: by retaining Russell, the Cubs are no better than the Redskins. Both offered contracts to domestic abusers. Like the Chiefs, the Cubs could have cut ties with Russell. That being said, the Russell case does offer a few signs of hope, beginning with the statements released by both Russell and Cubs President Theo Epstein. Yes, they are just words. But they express a rare dedication to action that is often missing in cases of domestic violence. Russell begins, “I offer my heartfelt apology to my family and my former wife Melisa for my past behavior.” From his opening words, Russell does two things that many athletes accused of misconduct neglect to do: 1) He actually apologizes, and 2) He places the victim at the forefront of his apology, rather than himself. Russell continues with further expression of his regret and guilt and lays out the steps he is taking to “improve” himself. His statement appears thoughtful, and unlike many others, he accepts the blame for his misconduct. Next, Epstein. He begins powerfully as well, acknowledging that Russell’s misbehavior “happened on our watch.” He goes on to explain the ways in which the organization aims to “become a small part of the solution,” including, notably, by maintaining “regular dialogue with Melisa to support her and to listen.” He addresses the team’s decision to tender a contract to Russell, explaining that it was a procedural step that “does not represent the finish line nor rubber-stamp his future as a Cub.” Finally, and most importantly, Epstein accepts that the Cubs have work to do as well. “In our own workplace, we are dedicating more resources to expand training for our players, their families and our coaching staff and front office,” he writes. “We will engage the appropriate experts to help us design programs for the Cubs which raise awareness of domestic violence, help prevent future incidents and make us the safest workplace possible.” The Cubs have also partnered with a Chicago-based organization that supports survivors of domestic violence. No, the Cubs did not cut Russell. But in Epstein’s statement, I see hope for actual change. 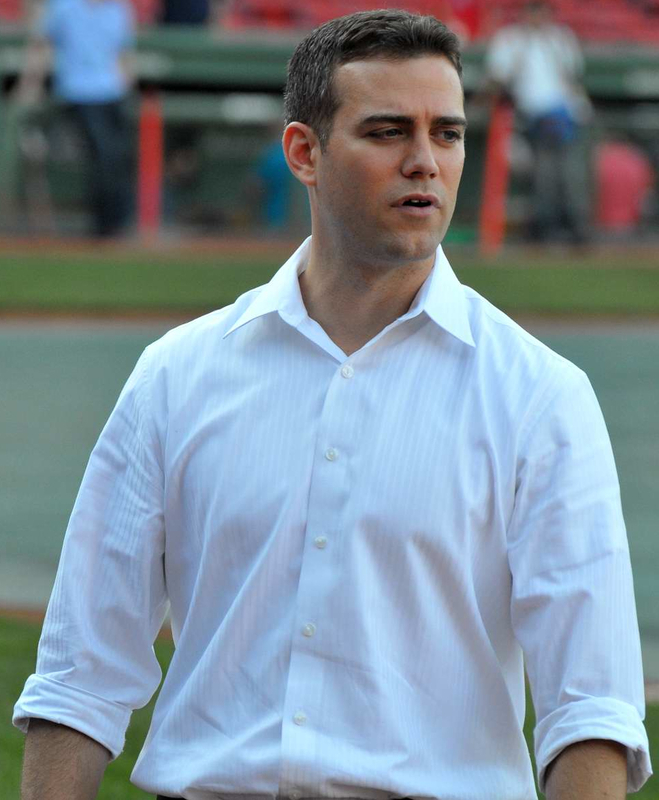 Not only does Epstein avoid absolving himself or his organization of all blame, as many executives and teams do in these situations, but he appears truly committed to “being a part of the solution.” He reiterates that the Cubs have clear expectations for Russell going forward, and highlights the team’s care to support the victim as well. These are all important, and sadly, rare. One well-worded statement from a sports executive is far from enough to change the narratives of domestic violence, misconduct in sports, or sports league’s continued mishandling of both and more. The NFL and MLB continue to demonstrate a true misunderstanding of the challenges their leagues and athletes face (and often create for themselves) and more troublingly, they do not seem genuinely committed to solving any of these issues. In Epstein’s statement, he makes one final claim that I find to be particularly significant. He writes, “We understand every action we take and word we use sends a message to our fans – all of whom have their own unique experiences and perspectives, and some of whom have a personal connection to domestic violence. The message we would like to leave you with is we take the issue of domestic violence seriously.” Epstein recognizes that the words and actions of his team and players have consequences. Again, rare. Based on that 2015 Gallup poll, roughly 200 million Americans are sports fans. That’s quite a large group of people that the sports world impacts and influences. For better or worse, athletes are seen as role models, thought leaders and cultural icons. They have the power, arguably even the obligation, to help shape the future generations of Americans. It’s time they act like it.